Mike Bellamy, finalist in the 1983 NSW State Championships, shares his memories of FAI combat in Sydney around that time. By the eighties, the "flying wing" F2D (FAI Combat) model was universal. The only real variation was not in design so much as construction materials. The era of mass produced (by club members, not the trade) wing cores made of foam was underway, and traditional balsa construction was beginning to wane. The state of the F2D art was best illustrated in Sydney by the well organised Doonside club. They would get together before large meetings and churn out huge numbers of foam wing cores which individuals would then take home to finish according to individual preferences. Through sponsorship from the importers, they were supplied with copious quantities of "Thunder Tiger" engines, which, when fed high dosages of nitro, turned from a mass produced, plain bearing engine into a competitive F2D power plant. The sponsorship meant that the engine could be virtually treated as a consumable, and so occasional failures could be easily tolerated. Also, aggressive modifications could be attempted without tears accompanying a slip of the dremel tool. 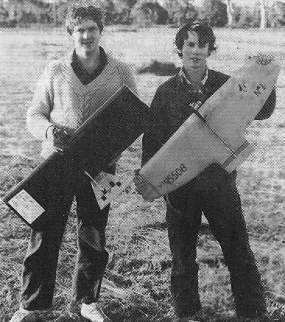 The models they produced were the ubiquitous foam "Boomerang" (In the attached photo, Graeme Barnes, on the right, is holding one of the "Doonside Boomerangs"). These were fantastically performing models, particularly considering the modest power plant. They were extremely light, superbly maneuverable and generally highly competitive in the right hands. Drawbacks, if picking nits, might have been that they were possibly a little too light for blustery conditions (with very little line tension) and fairly damage prone, although no more than other foam models. They had a couple of particular advantages for me. The design used timbers in standard lengths in many areas, so a single night could allow me to produce a dozen or so complete airframes with minimal cutting. They were also pretty tough, which was good for me because I was typically turning up to competition with half a dozen models as opposed to a carload. Lastly, they were very amenable to a running repairs with duct tape. Altogether a practical and robust, if slightly lower performing, model. The construction was basically of a pre-formed leading edge, a single, sheet, trailing edge, with a few ribs in between, and a large central rib to accommodate the engine with some hardwood bearers and support. Covered in cheap solar film, with a surgical tube bladder for fuel, they were crude, ugly, durable and effective. Engines were an exciting area for F2D competitors. Since the same size (2.5cc) was used in FAI Combat, FAI speed and quarter midget pylon racing (to say nothing of various car and boat categories), there was a huge choice in power plants. Over the years I had tried Fox, Super Tigre, MVVS, OPS, Rossis, Cox Conquest, and, my favourite (ignoring price), the Nelson. As time went on I basically settled on the Cox and Nelson power plants. The Cox, before K&B took them over, was a slightly fragile engine, which was a bit of a problem at times, exacerbated in combat, where there is a tendency to run lean toward the end of a fuel bladder run. This is compounded by being unable to shut off. With a good supply of front bearings always on hand, however, they gave excellent power without the need for significant tweaking or fiddling. The front bearing would fail occasionally, sending bits of cage through the engine. This was less of a problem than might be imagined, since by the time the bearing went, the cheap steel piston and liner would be typically starting to seize (black score marks on the piston), and so you would simply replace the lot. So the Cox was a fairly high power, high maintenance, but cheap power plant. I think by 1983 they had been unavailable for some years, but I had built up a pretty decent stockpile of engines and parts. The Nelson was a superb (if expensive) engine. I kept my favourite one aside for the 1983 NSW final, and after the bout a number of spectators commented to me that it was the fastest model they had ever seen in F2D. A couple of people jokingly suggested an undercarriage of some sort and an entry in the 2.5cc Rat Race! No modifications were necessary — they were even clear of swarf straight from the box. Robust, outstanding power output, they were a wonderful piece of engineering, reflected, of course, in the price. A final touch of class was provided by the extra fine needle valve thread which made tuning (often tricky with the extremely high fuel pressure from surgical tube bladders) more accurate. 6 x "Boofhead" F2D combat models (the absolute mininum as it turned out). 3 x Cox Conquest 2.5 cc engines. About 30 modified Taipan (I think) carbon fibre props, cut down to 6 x 4 inches. 1 x Nelson 2.5 cc engine. 1 x SuperTigre (an X15 I think) 2.5 cc engine. 1 x OPS 2.5 cc engine (which I didn't use). About a dozen spare Rossis (I forget whether No 2 or No 5) glow plugs. Various quantities and grades of glass fibre cloth. Four ready sets of 52 foot control lines and a spare roll of line. About a dozen fuel bladder tanks, plus the makings for more. Two huge veterinary syringes for filling the bladders. Bulldog clamps for sealing the bladders while starting. A few lead cell batteries and charger. Rolls of duct tape, glass tape and gaffer tape. Helmets for myself and for two crew members. Plus the usual huge toolbox full of odds and ends which every modeller seems to accumulate. Looking back, it seems ridiculous. Particularly when I think that by comparison with some other competitors I was travelling light! Particularly in the model department — the Doonside boys seemed to have whole carloads of models, all fitted with engines. The two areas where I felt I had a definite advantage were those of power (I had excellent engines — with the exception, perhaps, of the OPS, all were far more powerful than the Thunder Tigers which were so common, and the Nelson was an absolute screamer) and an experienced, hard working pit crew (thanks Richard and Greg!). By the end of the competition, the inventory was not looking quite so rosy, and my situation was as follows. Four of the "Boofheads" were write-offs. One was damaged but not beyond later repair at home. One was airworthy but had suffered some damage which had been repaired with liberal lashings of glass cloth, superglue and glass tape (although a few weeks later it simply disintegrated during a tight turn while sport flying at the local club field). The SuperTigre (always the first to suffer because of its side exhaust, which gets contact with the ground on each landing of an F2D model and so gets full of dirt) was unrunnable without risk of major damage (it cleaned out OK later). One of the Conquests had consumed its front bearing and was unrunnable (later replaced OK). Both other Conquests showed further black marks on the pistons, evidence of ongoing gradual seizure, although they were both still running as strongly as ever (I never once had one of these engines actually seize solid — they just seemed to get more and more scored until you couldn't bear to look at it any more and replaced the piston and liner). The Nelson, as always, was perfect. The OPS didn't get used — I swapped the Cox's between models after bouts. And of course there was the usual horrific toll on consumables — props, plugs, fuel bladders, and one set of lines which had been tangled and had to be cut free after a mid air incident of some kind. Doubtless the crew had the typical bruised knuckles and ringing ears to show for their efforts. In general, the actual conduct of the F2D bout was highly erratic. Often one, or occasionally both competitors would fail to start within the bout. Often one competitor would be up, while the other was starting or restarting. Pit crews were rarely recognised in F2D results, which was unfair, since on many occasions they decided the outcome, particularly in early rounds, either by timely engine starting, or sometimes even by running repair with the ubiquitous gaffer tape. The workload for the two-man crew was consistently higher than for team racing which was always viewed as the pinnacle of team cooperation. FAI team racing, for example, would require a start, and then two refueling stops during a race. A race could be lost, but rarely won because of pit stops. By contrast, a single combat bout would begin with an engine start, then a hand launch. The spare model would then have to be started (in case of a crash or engine stoppage) and held ready for launch. Downed aircraft would have to be retrieved, often from inside the circle which could be dangerous. Various tasks such as rinsing an engine, straightening lines, (re)starting engines, refitting or refilling bladder tanks (often a fiddly task), replacing glow plugs and making on the spot repairs with gaffer tape (sometimes while the motor was running) would all have to be undertaken often with two models roaring overhead at 160 kph with the constant threat of a crash. Crewing was not a job for the faint hearted. Between bouts there would nearly always be repairs to be undertaken - broken props to be replaced, glow plugs replaced, fuel bladders to be filled, exhausts to be rinsed, sometimes engine disassembly and reassembly, swapping of engines between worn and fresh models. I think crewing for an F2D competitor would probably be the highest crew workload of any event, with the possible exception of free flight scrambling. Occasionally two competitive aircraft would be in the air at the one time (at last), and it was then that F2D came into its own and turned from a boring yawn into the most superb spectator sport. When two models of lap times around 2 seconds, were trying to catch the other's streamer, the resultant near misses, and, of course, collisions, made for hugely entertaining spectacle. The reflexes required for this type of competition are not, I believe, approached in any other form of model or full size aerobatic competition (which I've competed at). My hands would be routinely shaking after the end of a bout. Developed 2001, revised 2005 by David Kidd. Your Webmaster is Ron Chernich.